Hase Weiss dollhouses are beautifully pastel, charming, modern, and infinitely variable. Available in myriad different sizes and styles, most of the lovely Hase Weiss dollhouses are blank slates that can be configured in different ways for varied looks and different styles of play. The dollhouses can all be intertwined so that what was once a small two-room house can gradually have other Hase Weiss dollhouse components added to it, thus expanding from a small studio, great for younger children, to a full house perfect for older kids. 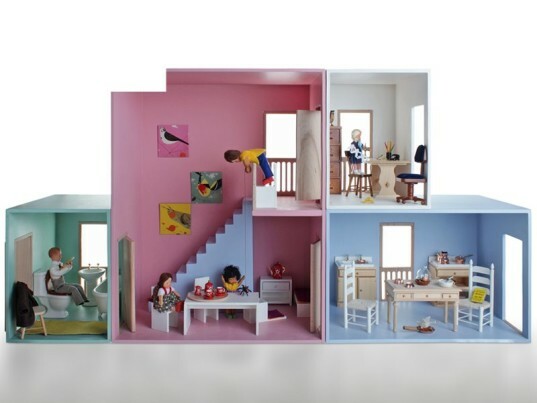 The larger modular dollhouses come with many rooms reconfigured in countless ways, allowing children to create a whole new look every time they play with it. Hase Weiss also offers extras such as staircases, or a dollhouse carrying case painted with a chalkboard finish so kids may draw items such as a garden, driveway, or swimming pools. For kids who love animals, Hase Weiss offers a dollhouse farm, built like a suitcase, so that kids can take it with them while traveling. Hase Weiss uses sustainable, safe materials for their toys, such as solid wood, Oeko-Tex standard wool and child-safe paints. All of their toys are built with a lot of love in a workshop in Poland. At present, when you visit the website, you’ll only see a delivery price list for the EU and Switzerland online, but if you’re not in their area, email Hase Weiss and they’ll send you a delivery price list. Prices for these sweet dollhouses are very reasonable at 69.90 EUR to 239.00 EUR (around $77.00 to $270.00 USD). See all the many Hase Weiss dollhouse options at their website. Hase Weiss dollhouses are beautifully pastel, charming, modern, and infinitely variable. 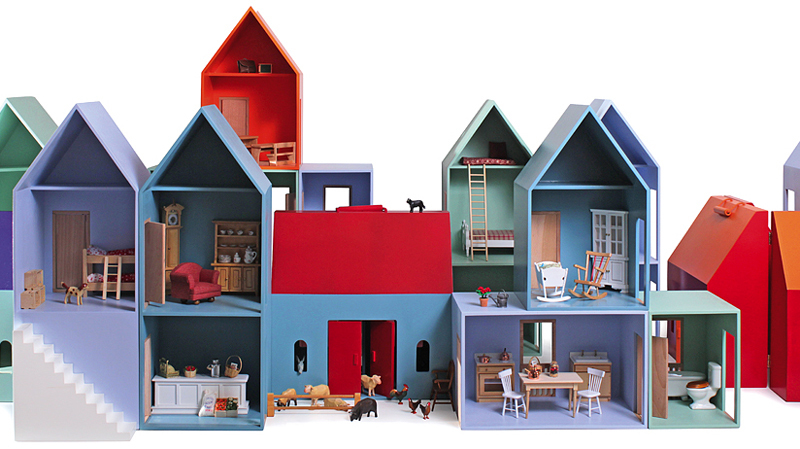 Available in myriad different sizes and styles, most of the�lovely Hase Weiss dollhouses are blank slates that can be configured in different ways for varied looks and different styles of play. The dollhouses can all be intertwined so that what was once a small two-room house can�gradually have other Hase Weiss dollhouse components added to it, thus�expanding from a small studio, great for younger children, to a full house perfect for older kids.�The larger�modular dollhouses come with many rooms reconfigured in countless ways, allowing children�to create a whole new look every time they play with it. Hase Weiss also offers extras such as staircases, or a dollhouse�carrying case painted with a chalkboard finish so kids may�draw items such as�a garden, driveway, or swimming�pools.�For kids who love animals, Hase Weiss offers a dollhouse farm, built�like a suitcase, so that kids�can take it with them�while traveling.